While Tropical Storm Harvey continues to batter southern Texas with catastrophic flooding, the disaster-relief votes of Texas Republican lawmakers are being criticized by one of their northeastern peers. In 2013, Sens. John Cornyn and Ted Cruz voted against a bill that authorized around $60 billion for programs dealing with areas and entities affected by Hurricane Sandy. The storm caused billions of dollars worth of damage and ripped apart more than 600,000 homes in the Northeast, mostly along the coastlines of New York and New Jersey. At the time, Cornyn and Cruz said the bill was filled with too much spending unrelated to the communities directly affected by the storm. Both senators were quick to write to President Trump last Friday to request a major disaster declaration for Harvey. The Sandy emergency relief bill failed to garner support among Texas Republicans in the House, too. Aside from Rep. John Culberson of Houston, all Republican Texas members of Congress voted against the bill. It ultimately made its way past the House and the Senate, and was signed by President Obama. Republican Rep. Peter King of New York did not forget about Republicans who voted against the Sandy aid. On Saturday, he referenced Cruz's voting record on Sandy relief funding, but he pledged not to hold Cruz's vote against him when members return to Capitol Hill after Labor Day and likely address emergency funding for Harvey. On Monday, Cruz shot back at King during an interview on CNBC's "Fast Money Halftime Report," characterizing King's comment as a distraction from the search-and-rescue operations in the Houston area. "I'm not going to worry about political sniping. My focus here is on the tragedy that is unfolding, on the people whose lives are in jeopardy and the people who need help," he said. Cruz also stood by his vote, saying, "I would have eagerly supported funding for that, but I didn't think it was appropriate to engage in pork-barrel spending where two-thirds of that bill was unrelated spending that had nothing to do with Sandy and was simply politicians wasting money." In a statement to CBS News, a spokesperson for Cornyn explained that the senator, at first, supported Sandy emergency funding but balked on a separate amended version of the bill. The amended version, among other things, added wider provisions to address infrastructure and environmental concerns on the Gulf Coast caused by Hurricane Isaac earlier in 2012. "The version that ended up passing unfortunately contained provisions unrelated to the storm and 'emergency' money that wasn't requested by local officials there," the statement said. "[Cornyn] voted for a Sandy aid package without this unrelated spending, which funded things like repairing fisheries in the Pacific." 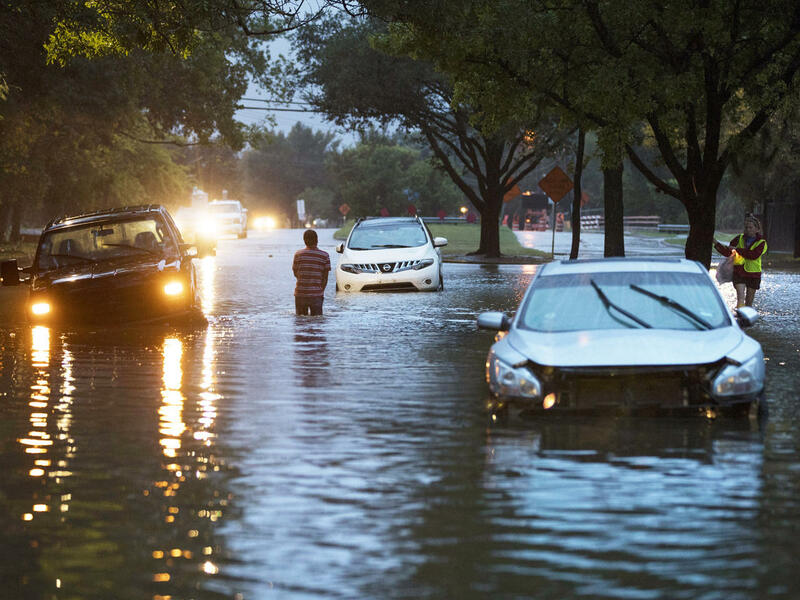 Eight Texas Republican representatives also voted against another bill granting the Federal Emergency Management Authority (FEMA) power to borrow $9.7 million for the National Flood Insurance Program. The bill ultimately passed and was signed into law by the president. Those GOP representatives include Mike Conaway of Midland, Roger Williams of Austin, Kenny Marchant of Coppell, Bill Flores of Bryan, Louie Gohmert of Tyler, Mac Thornberry of Clarendon, Randy Weber of Pearland and former Rep. Randy Neugebauer of Lubbock. None of those House Republicans who voted against the flood funding bill could be reached for a comment. Damages from Harvey, which made landfall on the Texas coast last Friday as a category-4 hurricane and later turned into a tropical storm, are predicted to cost tens of billions of dollars. Some Texas Democratic lawmakers such as Reps. Sheila Jackson Lee of Houston, Joaquin Castro of San Antonio, and Beto O'Rourke of El Paso have already pledged their support for emergency appropriations to be voted on by Congress. In a press conference on Monday, President Trump expressed hope that Congress would pass emergency funding in response to Harvey. "The real number, which will be many billions of dollars will go through Congress. I think it will happen very quickly. It'll go very fast," Mr. Trump said.